A new study details how researchers used injections of non-depleting antibodies to reverse the onset of Type I diabetes in mice genetically bred to develop the disease. Chapel Hill, North Carolina – Scientists at the University of North Carolina School of Medicine have used injections of antibodies to rapidly reverse the onset of Type I diabetes in mice genetically bred to develop the disease. Moreover, just two injections maintained disease remission indefinitely without harming the immune system. The findings, published online ahead of print (June 29, 2012) in the journal Diabetes, suggest for the first time that using a short course of immunotherapy may someday be of value for reversing the onset of Type I diabetes in recently diagnosed people. This form of diabetes, formerly known as insulin-dependent diabetes mellitus, is an autoimmune disease in which the body’s own immune T cells target and destroy insulin-producing beta cells in the pancreas. The immune system consists of T cells that are required for maintaining immunity against different bacterial and viral pathogens. In people who develop Type 1 diabetes, “autoreactive” T cells that actively destroy beta cells are not kept in check as they are in healthy people. Senior study author Roland Tisch, PhD, professor of microbiology and immunology at UNC, said a need for effective immunotherapies also exists to treat Type 1 diabetes in people already living with the disease. “Clinically, there have been some promising results using so-called depleting antibodies in recently diagnosed Type 1 diabetic patients, but the disease process is blocked for only a short period of time,” Tisch said. “These antibodies don’t discriminate between T cells normally required for maintaining immunity to disease-causing pathogens and the autoreactive T cells. Therefore T cells involved in maintaining normal immune function are also going to be depleted. Tisch said his UNC lab has been studying the use of certain “non-depleting antibodies.” These bind to particular proteins known as CD4 and CD8 expressed by all T cells. Just as the name implies, when these non-depleting antibodies selectively bind to CD4 and CD8 they don’t destroy the T cells; the overall numbers of T cells are unaffected. With this in mind Tisch wanted to determine whether these non-depleting antibodies could have a therapeutic effect in the non-obese diabetic, or NOD mouse, an excellent model for human Type 1 diabetes. The answer is yes. In some of the recently diagnosed NOD mice, blood sugar levels returned to normal within 48 hours of treatment. Within five days, about 80 percent of the animals had undergone diabetes remission, reversal of clinical diabetes. “The protective effect is very rapid, and once established, is long-term,” he said. “We followed the animals in excess of 400 days after the two antibody treatments, and the majority remained free of diabetes. And although the antibodies are cleared from within the animals in 2-3 weeks after treatment, the protective effect persists.” The study showed that beta cells in the NOD mice had been rescued from ongoing autoimmune destruction. In looking for the mechanism to explain how the therapy worked, the researchers found that the antibodies had a very selective effect on T cells that mediated beta cell destruction. 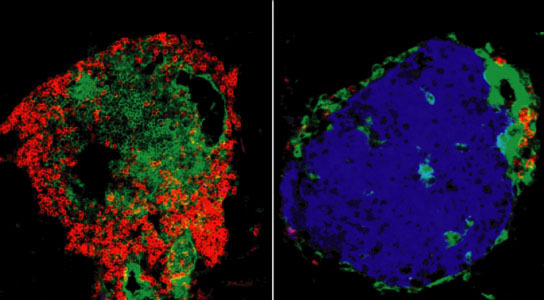 After treatment, “all the T cells that we would normally see in the pancreas or in tissues associated with the pancreas had been purged,” said Tisch. This despite the fact that the numbers of T cells found in other tissues and blood were unaffected. UNC study coauthors with Tisch are first-author, Zuoan Li, (now at the University of Iowa); Ramiro Diz, Aaron Martin, Yves Maurice Morillon, Douglas E. Kline, (now at the University of Chicago); Li Li (now at Harvard Medical School); and Bo Wang. Support for research came from the National Institute of Diabetes and Digestive and Kidney Diseases, part of the National Institutes of Health; and from the Juvenile Diabetes Research Foundation. Be the first to comment on "Non-Depleting Antibodies Reverse Type 1 Diabetes in Mice"